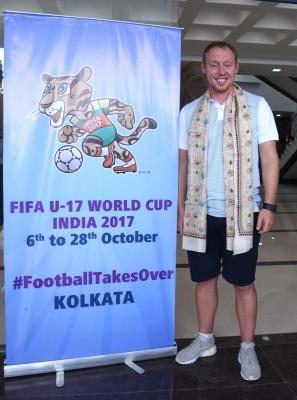 Kolkata, Oct 25 (IANS) England coach Steve Cooper on Wednesday lauded his wards who outsmarted Brazil 3-1 in the FIFA Under-17 World Cup semi-final here, saying the way they played was way beyond their age. “When you play against a team like Brazil, I think there were two main ways of scoring tonight. One is transition — if we attack quickly we might get behind their back line as quickly as we can. If not, we had to be patient, get together, fill the spaces down the side from crossing areas. To score three goals from something that we planned was really pleasing. That again is recognition for the boys,” Cooper told reporters after the match. “Realising how to score, where are the spaces and making good decisions. We made some substitutions. Emile Smith-Rowe created the third goal by getting into that area as well. Rhian Brewster scored a hat-trick as the Young Lions stormed into their maiden final at this level. Cooper said the fact that they stuck to their plan which he would not change for any opposition, was satisfying and a recognition of the good work done in their country and by the English clubs at the youth level. “We scored three goals and Brazil had conceded only a couple throughout the whole tournament. They are a strong team. We would have liked the ball a bit more in the first half and that’s normally our style of play,” he said. “But it’s not always as easy for that to happen — particularly when you play a World Cup semi-final on a big occasion and against a very good team. So there was a little bit of fight for possession in the opening 25-30 minutes. But eventually we settled down and got our positioning right on the pitch. As soon as we did, we managed to get in really well and took our chances, scored three goals. We are worthy winners overall. Cooper spoke of the English FA’s DNA programme launched in 2014, saying they are a part of it and the long term goal is to win World Cups and European Championships at the senior level. “What we are trying to do with the DNA and St-George’s Park. So it’s part of a long term process. We are just going to enjoy the moment. We need to stick to a plan and recover tomorrow. We need to sit with the boys. We will comeback ready to go again in a few days and maybe the crowd might get behind us. “We are a part of the DNA process. There is no doubt about that. We are one of many England teams trying to do the same thing as part of a bigger plan. They go hand in hand. What we are doing is fantastic out here but it’s part of the greater good. That’s winning World Cups and European Championships at senior level. Cooper waxed lyrical about Brazil coach Carlos Amadeu, adding his boys deserve a lot of credit for their positioning in the second half.